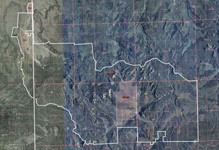 H Bar V Ranch - Apache County, AZ - Headquarters West Ltd. The H-V Ranch consists of approximately 5,876 acres of deeded land in Arizona and New Mexico with an additional 80,751 acres National Forest leas land in the Quemado Ranger District of the Gila National Forest. The ranch headquarters is located on approximately 1,392 deeded acres in Arizona along Coyote Creek. Building improvements at the main headquarters site include a manager’s house, five cabins, three hay barns and numerous out buildings. There is also a full set of working corrals at the headquarters. There is approximately 360 acres of irrigated farm land along Coyote Creek, irrigated with diversionary and storage rights on Coyote Creek. H-V Reservoir and Lake Marie are used as the storage reservoirs for the irrigation water. Recently, only 120 acres have been farmed due to drought and lack of available irrigation water. 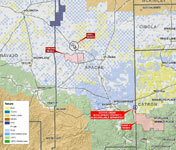 The Gribble Cow Camp is located on approximately 4,445 deeded acres in the Spur Lake Basin in New Mexico, near the east central portion of the ranch. Building improvements consist of a cowboy cabin/house, a bunkhouse, large hay shed, several outbuildings and a complete set of working corrals. Bill Knight Spring contains the remaining 40-acres of deeded land and is located just off Forest Road 19, one mile before coming to Spur Lake Basin. 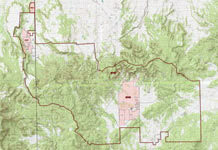 The ranch is located on both sides of the Arizona/New Mexico state line. The majority of the grazing allotment and the Gribble Place is located in New Mexico within the boundary of the Apache National Forest. The property is operated as a single unit and utilized for cattle grazing. Topography and vegetation varies significantly throughout the ranch from open rolling grassland to scattered pinion/juniper woodlands, to high mountain elevations with ponderosa, conifer and aspen trees. The ranch is located along the Arizona/New Mexico state line approximately 15 miles southeast of Springerville, Arizona and 35 miles southwest of Quemado, New Mexico. US Highway 60 provides access to Apache County Road #4225, then southeast 8 miles to the ranch boundary and the headquarters site along Coyote Creek. The ranch stretches to the east into Catron County, New Mexico, approximately 20 miles to the eastern boundary. Access to the Gribble Place is provided by forest road #205 from the headquarters. Interior access is provided by numerous forest county roads. The Arizona deeded property lies along Coyote Creek and varies from thickly treed hillsides to open meadow land. Primary tree cover consists of Pinion/Juniper Woodlands with scattered Ponderosa Pines on the mesas surrounding the valley. Coyote Creek meanders from south to north through the deeded lands and immediately adjacent to the headquarters buildings. Numerous clumps of Oak trees surround the buildings and irrigated fields. Elevation ranges from 7,300 to 7,800 feet across the property. The New Mexico deeded property lies primarily in the Spur Lake Basin and is completely surrounded by National Forest property. The Spur Lake property is primarily open grassland surrounded by thickly covered hillsides. Tree cover consists of Ponderosa Pines and Oak. Approximately 40 acres is non-contiguous to the Spur Lake property and is located at the bottom of the hill under Bill Knight Gap and just above Bill Knight Spring. This 40 acre parcel is very private and secluded with many large Oak and Ponderosa Pines. Bill Knight Spring has been developed for livestock watering use. Elevation on the Spur Lake parcel ranges from 7,380 to 7,800 feet and the Bill Knight parcel ranges from 7,800 to 8,000 feet. Vegetation on the property is classified as short grass (plains) grassland. Primary grasses are blue grama, black grama, needle-and-thread, muhlys, sand dropseed, and galleta. The majority of the area is pinion/juniper woodland with many “old growth” type trees. The higher elevations also have ponderosa pine, conifer and aspen trees with pine drop seed, kentucky blue grass and mountain muhly grasses. Managers Home: 2,012 square feet of wood and rock construction, metal tin roof, 4 bedrooms, 2 bathrooms with a rock fireplace and forced air for heating. Cabin #1/Art Studio: 1,111 square feet, old log and wood construction with wood floor, fireplace, 1 bedroom, 1 bathroom and a metal tin roof. Cabin #2: 816 square feet, old log and wood construction with wood floor, fireplace, 1 bedroom, 1 bathroom and a metal tin roof. Cabins #3, 4 & 5: total 1,520 square feet and are connected by a covered porch and walkway. They are all old log and wood construction with wood floors, fireplace, 1 bedroom, 1 bathroom each and a metal tin roof. Cabin #5 is unfinished inside and currently used as a tack room. Hay Shed: 1,792 square feet, wood frame construction (telephone pole) with metal tin roof, dirt floor and open walls. Hay Storage/Horse Stalls: 930 square feet, wood frame construction with metal tin roof, dirt floors and attached horse corrals. Log Hay Barn: 960 square feet, log and wood construction with metal tin roof, dirt floors and attached horse corrals. Horse Shade: 883 square feet, telephone pole construction with wood framing, metal tin roof and dirt floor with attached corrals. Tack Shed: 380 square feet, wood construction, metal tin roof and wood floor. Generator House: 240 square feet, wood frame construction, metal tin roof and concrete flooring. Shop/Storage Shed: 2,400 square feet, wood frame and telephone pole construction, metal tin roof with partial concrete and dirt flooring. Wood Shed: 196 square feet, wood frame construction, metal roof and dirt floor. House: 1,162 square feet, wood frame construction, metal tin roof and wooden floors with a small screened in porch in the back of the house. Bunkhouse: 476 square feet, wood frame construction, metal tin roof and wooden floors. Feed Shed: 520 square feet, wood frame construction, metal tin roof and concrete floor. Generator House: 80 square feet, wood frame construction, metal tin roof and concrete floor. Hay Shed: 1,344 square feet, telephone pole construction, open walls, metal tin roof and dirt floor. Tack/Stalls/Hay Shed: 1,880 square feet, wood frame construction, wood siding, metal tin roof and dirt floors. Calving Shed: 936 square feet, wood frame construction, wood siding three walls only, metal tin roof and dirt floors. Well-drained, deep, nearly level to gently sloping clay loams and sandy clay loams formed in alluvium. Shallow and deep, well drained, sloping to steep soils; mainly on mesas, hills, and alluvial fans. Shallow and moderately deep, well drained, level to steep soils; on hills, mountains, alluvial fans, and plains. Telephone service is provided by Western New Mexico Telephone. No other public utilities are available to the ranch. Electricity is by private diesel generators, sewer service is provided by septic systems and propane is used for heating and cooking. Domestic water at the headquarters is provided by a private well with an electric submersible pump filling a 5,000 gallon water tank on a hill above the building site. The water then gravity feeds back to the houses and corrals for livestock water. Irrigation water is diverted from Coyote Creek into several dirt ditches and flooded across the fields. Water is also stored in two reservoirs, H-V Reservoir and Lake Marie. H-V Reservoir has a storage right for 541.8 acre feet per annum and Lake Marie has a storage right for 180 acre feet per annum for a total of 721.8 acre feet per annum of storage. The ranch has two registered water claims for use of 541.8 acre feet per annum and 320 acre feet per annum for a total of 861.8 acre feet per annum. These registered claims are for irrigation and livestock purposes on a total of 360 acres. Water is solely obtained from Coyote Creek and in dry years, there is not enough water in the creek to fully utilize the registered claims. Over the past five years, the ranch has only had enough water to irrigate approximately 120 acres due to drought and small flows of water in Coyote Creek. Domestic water at the Gribble Place is supplied by a private well with an electric submersible pump filling an elevated storage tank that gravity feeds back to the house and corrals for livestock. There is approximately 120 acres of “dry land” farm which has not been utilized in many years. The ranch has simply used the property for livestock grazing. There are no known irrigation claims for this acreage. The deeded property in New Mexico has five separate water adjudications from the New Mexico State Engineers Office totaling 15 acre feet per year for livestock use only. There are no irrigation rights associated with the New Mexico deeded lands. There is approximately 38 miles of pipeline with numerous drinkers and storage tanks spread throughout the ranch. The pipelines are spring fed with pumping stations along the way. In addition to the pipeline there are several wells with windmills and numerous dirt tanks and springs scattered across the ranch. Overall the ranch contains adequate water to support the livestock and fully utilize the range. The portion of the ranch located in New Mexico has historically participated in the big game landowner hunting permit program administered through the New Mexico Game and Fish Department. Tag allocations vary from year to year depending on herd population and landowner willingness to participate. The past two seasons the ranch has received 4 bull elk – archery tags, 4 bull elk - muzzle loader tags and 5 cow elk– archery/muzzleloader tags.